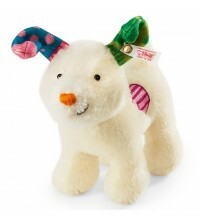 This Steiff dog is made in Germany in 2014. He is 16 cm. / 6.4" tall. 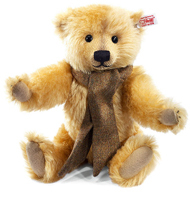 This Steiff bear is designed for the Steiff 2014 collection. Made out of light brown mohair. 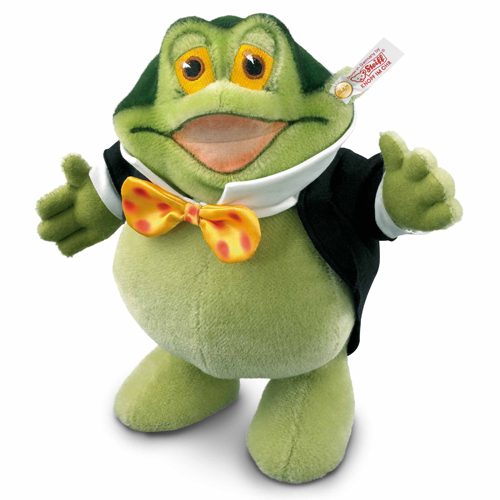 Fully jointed, stuffed with synthetic filling, with safety eyes. 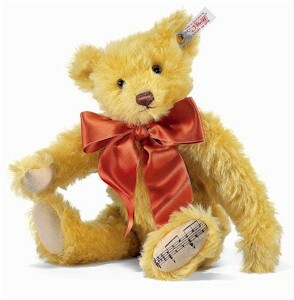 This Steiff bear will be made for 2013. 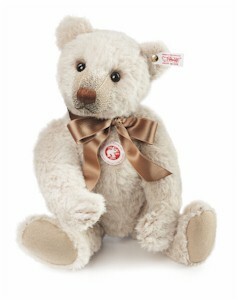 The British Collector bear is made out of Bear is made out of off white alpaca. He is 36 cm. / 14.5" tall. Fully jointed, stuffed with synthetic filling; with boot button eyes and bow. This Steiff Dominic is made for 2012. He is 29 cm. /11.6" tall. Made out of blond mohair. He is wearing a vintage scarf. He is limited to 1.500 pieces for the UK only. Toad is 27 cm. / 10.8" tall. He is made by Steiff in 2009 for Danbury Mint. He is made to honour the 100th anniversary of the famous book "The Wind in the Willows" by Kenneth Grahame. His arms and head are jointed. He is limited till the end of 2009. 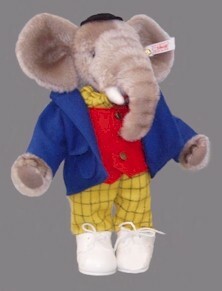 This plush Edward Trunk is made for England in 2008. He is 28 cm. / 11" tall. 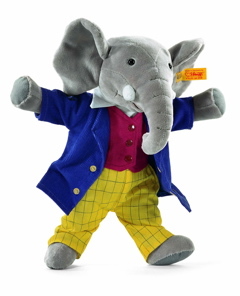 Edward Trunk is a friend of Rupert Bear. He is made for England in autumn 2007 in a limited edition of 1.500 pieces. This musical bear is made for England at the autumn of 2007. He is 30 cm. / 12" tall and limited to 3.000 pieces. He has a music box that plays "teddybear`s picnic". This bear is 20 cm. / 8 inches tall and limited to 1500 pieces. This bear is specially made for England in 2004. 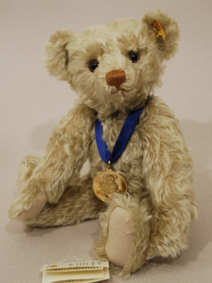 In his hands he has a medal given to Steiff after they helped furnishing the World Exhibition in New Orleans. This wonderful bear is 36 cm. / 14,5 “ tall and limited to 4.000 pieces. It is a replica from the Roaring Twenties. 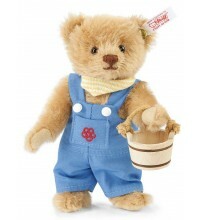 This bear has been made for Danburry Mint in England. The bear has only been made in 2004. 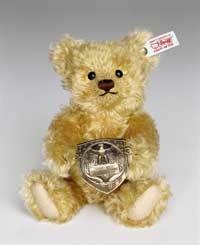 He comes wit a gold plated medal of a Steiff bears. 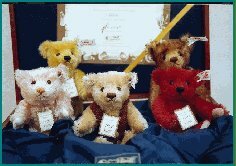 Those 5 miniature bears are replicas of the last 5 special UK editions. They are all around 16 cm/ 6,25 inches tall. They come in a beautiful wooden box with certificate. It is a limited edition of 1847 pieces. 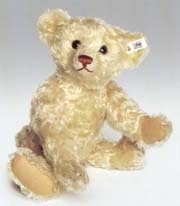 This bear is made by Steiff for England in 1996. The bear is 43 cm. / 17.2" tall and limited to 3.000 pieces. This bear is made by Steiff for England in 1994. The bear is 40 cm. / 16" tall and limited to 3.000 pieces. This bear is made by Steiff for England in 1990. The bear is 33 cm. / 13.2" tall and limited to 3.000 pieces. The bear is 42 cm. / 16.8" tall and limited to 2.000 pieces. He plays Rossini`s "Die diebische Elster". 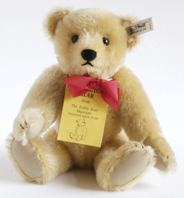 This teddy bear is made for the organisation Safe the Children in England in 1996. The bear is 32 cm. / 12.8" tall and limited to 3.000 pieces. This bear is made for the Teddy bear museum in Stratford up on Avon in England in 1987. The bear is 29 cm. / 11.6" tall and limited to 2.000 pieces. It is a replica of a 1909 bear.